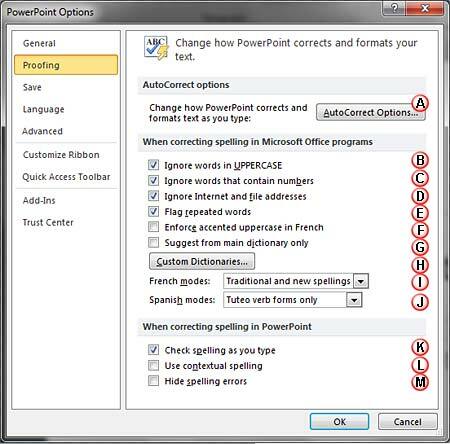 Learn how to set spell check options in PowerPoint 2010. AutoCorrect Options: Clicking this button brings up the AutoCorrect dialog box -- learn more in our AutoCorrect options in PowerPoint 2010 tutorial. Flag repeated words: This flags second and subsequent instances of the same word in a row, for example preventing you from writing "the the". Enforce accented uppercase in French: This is option is only applicable when the editing language is French -- suggests accents for uppercase letters as appropriate. Custom Dictionaries: Clicking this button opens the Custom Dictionaries dialog box, where you can make changes to custom dictionaries. Learn more in our Edit Custom Dictionaries in PowerPoint 2010 tutorial. Use contextual spelling: Allows PowerPoint to flag possible errors in contextual language usage. For example, PowerPoint identifies "I will go their" as an error and suggests that you use "I will go there". Hide spelling errors: Disable the red squiggly underlines that automatically appear underneath misspelled words. When done, click the OK button to close the PowerPoint Options dialog box. Any changes you made will be applicable immediately -- PowerPoint starts following these changed settings the minute you click the OK button, not only in the active presentation, but also in any presentation you create or edit henceforth -- in fact these changes will apply to all Microsoft Office programs installed on your computer.